Helianthus ‘Sunbelievable’ is just that - a branching sunflower with truly unbelievable flower power! Packing a punch with hundreds of gloriously golden, two-tone sunflowers. Blooms and Blooms! We counted over 1,000 flowers in a year! 'Sunbelievable' is perfect for growing in containers or in flower borders, with masses of pollen-free flowers, so you'll have more than enough to bring into your home! Multiple award-winning, including third place finalist in the prestigious 2018 RHS Chelsea Flower Show Plant of the Year Competition. Supplied as a large plant in a 3L pot, in bud and ready to be planted up - the largest available - 'Sunbelievable' will grow to around 60cm x 25cm (24in x 10in). Helianthus ‘Sunbelievable (TM)’ is just that - a plant with truly unbelievable flower power! 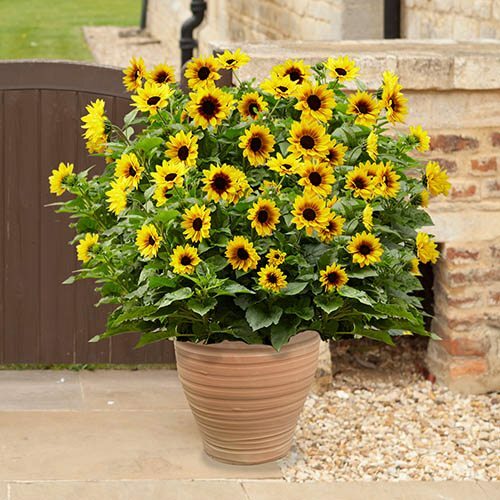 The first ever-blooming annual sunflower, it certainly packs a punch with hundreds of gloriously golden sunflowers each with a mahogany centre 'eye'. You'll be amazed how it just blooms and blooms and blooms - from early summer right up until the first frosts. A multiple-branching sunflower, the large, golden-yellow flowers are 8-10cm (3-4in) across and are held above richly coloured foliage that deepens in hue over time, really setting the garden aflame with dazzling tones and sizzling exuberance. Supplied as a large plant in a 3L pot - the largest size currently available - in bud and ready to be planted up, this is a superb value-for-money plant - we've joked that if a plant was on steroids, this would be the result! 'Sunbelievable (TM)' is perfect for growing in containers or in flower borders, where this new introduction produces an abundance of pollen-free flowers on multi-branched stems, so you'll have more than enough to bring into your home! As well as many international awards, Helianthus 'Sunbelievable (TM)' picked up third place finalist in the prestigious 2018 RHS Chelsea Flower Show Plant of the Year Competition, proving that it has what it takes to make a garden winner. With a long flowering season - non-stop from May until the first frosts - it's reliable, robust and easy to grow, so is ideal for first-time gardeners and seasoned veterans alike! With the promise of over 1,000 blooms in a year, one of our growers at the nursery said he gave up counting at 1,000 in July…so we know first-hand that it has the potential for truly unbelievable garden performance all summer long. And the secret to the success of this amazing plant? Well that's down to its inability to set seed - a good thing if you don't want to be constantly weeding out unwanted seedlings - but also it means that all of the plant's energy goes into flower production - win-win if you ask us! Growing to around 60cm x 25cm (24in x 10in), 'Sunbelievable' will behave itself and not seed everywhere which makes it a perfect low maintenance plant for any gardener. Feed and water regularly, and don't foreget to dead-head to keep those flowers coming! Protect plants from late frosts. Plant in a sunny, warm position in the garden or plant into your favourite container using a good quality compost. Sunflowers prefer long, hot summers to flower well. In the garden, dig a hole 3 x the size of the pot and incorporate some well-rotted manure or compost into the soil removed. Remove the plant from its pot and tease out some roots. Place the plant into the hole, up to the level that it was in its pot. Backfill the hole and firm the soil. Work in a slow release granular fertilizer 20cm (8in) deep into your soil.